A helpful reader has sent me copies of three recently published papers on China's first planetary probe, the Yinghuo-1 orbiter. Yinghuo-1 is planned to launch late next year, hitching a ride to Mars on the Russian Phobos sample return mission, Phobos-Grunt. In this way it's quite different to IKAROS, which got a ride toward Venus with Akatsuki; IKAROS and Akatsuki went their separate ways immediately after launch, while Yinghuo-1 will remain connected to Phobos-Grunt for an 11-month cruise, only separating after Phobos-Grunt successfully enters Mars orbit. 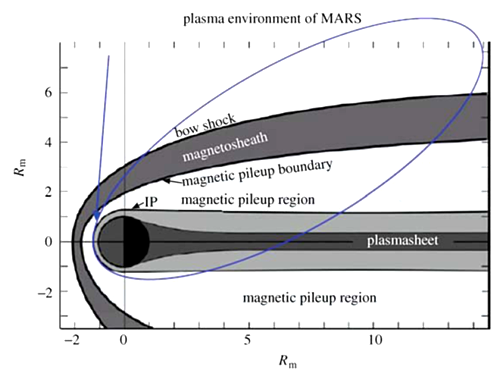 The following is based on two papers from 2010: The Key Techniques and Design Features of YH-1 Mars Probe," by Chen Chang-Ya, Hou Jian-Wen, and Zhu Guang-Wu, and Scientific Objectives of China-Russia Joint Mars Exploration Program YH-1, by Wu Ji, Zhu Guang-Wu, Zhao Hua, Wang Chi, Li Lei, Sun Yue-Qiang, Guo Wei, and Huang Cheng-Li, both published in Chinese Astronomy and Astrophysics in June. Another paper, "Yinghuo-1 -- Martian Space Environment Exploration Orbiter," by Zhao Hua, was published in the Chinese Journal of Space Science in 2008, and is actually available without a subscription. 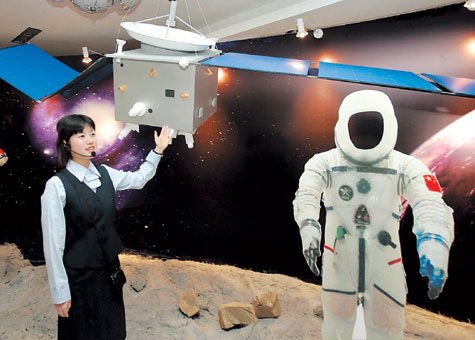 An assistant demonstrates a model of a Mars exploration probe, displayed at the Shanghai Minhang District Museum on May 21, 2007. Yinghuo-1 is a very small spacecraft, massing only 115 kilograms and with a box-shaped bus well under a meter on a side (actually 750 by 750 by 650 millimeters). Its solar array will span 6.85 meters when deployed, and its high-gain antenna is 950 millimeters in diameter. This is all unusually tiny for a deep-spacecraft; the small dimensions are made possible by the fact that it does not carry a large orbit insertion rocket, relying instead on Phobos-Grunt to do the work of getting to Mars and staying there. Its name, which (according to Wikipedia) translates to "Firefly" (literally, "luminous fire," pinyin "yínghuǒ"), acknowledges this tiny size, but also apparently is a play on words; the homophone "yínghuò" is an ancient Chinese name for Mars. Here are the two illustrations of Yinghuo-1 in stowed and deployed configurations, taken from the Chen et al. paper. These are pretty low-quality but the best images I can find. They seemed to have been scanned in black and white from a Chinese language publication before insertion into the paper I took them from -- you could see the ghost of Chinese text in the white areas before I corrected for that! From left to right: Yinghuo-1, Mars Reconnaissance Orbiter, Mars Odyssey, Mars Exploration Rover. Once at Mars, Yinghuo-1 will be inserted into a near-equatorial, elliptical orbit. The spacecraft will approach to within 400 to 1000 kilometers of Mars' surface at closest approach, and swing out to 74,000-80,000 kilometers above the surface at its most distant, according to the Chen et al. paper; the Wu et al and Zhao papers state 800 to 80,000 kilometers. Zhao states the orbital period will be about 72.8 hours. Interestingly, neither of these coincides with Phobos' orbit, which is 6,000 kilometers above Mars' surface. The nominal mission will last one year. Yinghuo-1 will be inserted into an elliptical orbit around Mars that approaches to within 800 kilometers at its nearest point and reaches to 80,000 kilometers at its farthest point, with a period of 72.8 days. The orbit will allow Yinghuo-1's magnetometer and plasma science package to survey all parts of Mars' plasma environment and magnetic field. Yinghuo-1's scientific objectives are focused mostly on Mars' upper atmosphere and space environment. Among all its objectives and planned measurements, the most unusual and groundbreaking experiment is one in which Phobos-Grunt and Yinghuo-1 will work in tandem to measure the structure of Mars' ionosphere. The two spacecraft will point at each other, and Phobos-Grunt will broadcast a signal through Mars' ionosphere to an "occultation receiver" on Yinghuo-1. Wu et al. explain the experiment this way: Yinghuo-1 is going to "receive the signals at two frequencies (833 MHz / 416.5 MHz) from the Russian Phobos-Grunt probe and to measure the signal amplitudes and carrier phases at these two frequencies, then to obtain the electron density profile and total electron content of the Martian ionosphere by on-the-ground post-processing." The rest of the scientific payload includes a plasma detector package and a fluxgate magnetometer for analyzing in-situ energetic particles and magnetic fields, as well as a small (1.5-kilogram) camera, which Zhao actually states is "for the public outreach" -- yay! Wu et al. provide the most information about it, though it's not a lot of detail. It sounds like it is a framing camera, and it seems it's intended, in part, to document in photos the separation of Phobos-Grunt and Yinghuo-1. The paper doesn't say anything about whether the camera has color capability. Since it's intended to watch the spacecraft separation, I am guessing that what we're dealing with is a lot like Mars Express' "Mars Webcam" -- an engineering camera that should also be in a great position to snap global views of Mars. The stated pixel size is four megapixels, so I assume (but do not know for sure) that its detector is 2048 pixels square. The Wu et al. paper says that Mars fills the field of view when it is 10,000 kilometers from the spacecraft; if I've done my trigonometry right, that gives a field of view of roughly 40 degrees. The earlier Zhao paper says a field of view of 30 degrees. Wu et al. say that it achieves "better than" 0.5-kilometer-per-pixel resolution at perimartian distance (which they said earlier was 800 kilometers). That gives a pixel resolution of 0.6 milliradians, which calculates back out to a field of view of 70 degrees -- so either my assumption of 2048 pixels square is off by a factor of 2, or the camera gets significantly better than 0.5-kilometer-per-pixel resolution at its perimartian distance. If I'm reading the paper right, the engineering requirement was for better than 0.5 kilometers per pixel; the camera may be capable of better than that. Although the science goals of Yinghuo-1 are important, clearly the mission's main importance is to be a first test of the Chinese space agency's ability to meet the challenges unique to flying deep space missions. China, of course, has substantial experience launching and operating spacecraft (including human missions) in Earth orbit. But deep space missions have their own set of challenges. 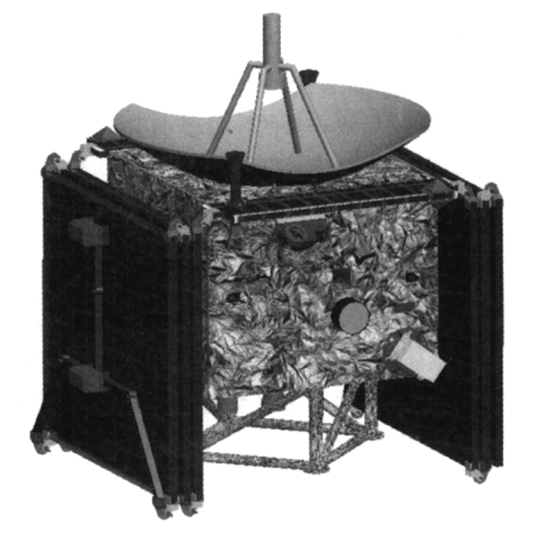 Operating a spacecraft where there is a significant communications delay due to the great distances involved; maintaining three-axis control, pointing alternately to the Sun, Earth, Mars, and Phobos-Grunt, without the benefit of ground control networks and navigational satellites to help in localizing the spacecraft; maintaining spacecraft health through a nearly year-long hibernation in cruise, and only then deploying its solar panels; and dealing with the extremes of temperature associated with the cruise, varying distance to Mars, and periods spent in Mars shadow. Yinghuo-1 will be a first test of China's ability to meet these challenges, blazing the first trail through the wilderness for future missions. If I am reading the papers correctly, I think that the most nerve-wracking moment for Yinghuo-1's Chinese team -- apart from launch and orbit insertion, which are up to the Russians and not under the Chinese team's control -- will be when it comes time to deploy the solar panels. Deploying solar panels is something nearly every mission has to do, so it may not seem so scary, but Yinghuo-1 will be doing something that few other missions have attempted: deploying the panels a year after launch, after a very, very cold cruise and after the rigors of launch and orbit insertion. The Chen et al. paper said they validated the deployment of the solar panels following a 24-hour storage at a temperature of -180°C, 30 degrees colder than the lowest expected operational temperature for the panels (which will be when the spacecraft spends 8-hour periods per orbit in Mars' shadow). Will it still work after the 11-month cruise? Cross your fingers!